Dijon Impr. De Frantin 1849 225x143 mm. 40 pp. With remains of spine of the original wrappers, both covers lacking. A very good copy, occasional finger-soiling. Dijon, Paris Imprimerie de E. Tricault 1850 225x135 mm. 23 pp. (including half title). Unbound, the last four leaves light loose. A very good copy, light spotting, a few thumb-soiling. Rather browned the outer blank margin of the first three leaves. On the top of the first page, pencilled note ‘Mr. Flauti’. 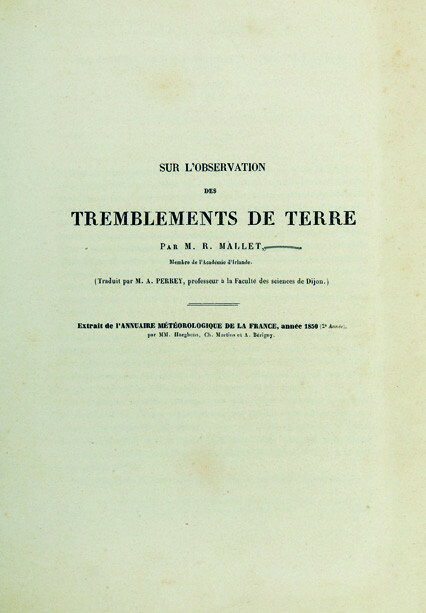 Offprint from: Mémoires de l’Académie des Sciences, Arts et Belles-Lettres de Dijon (1850). Milan Tipografia Bernardoni 1851 283x207 mm. il,  70 pp. One illustration in text. Upper and lower covers lacking, remains of spine. Blue sprinkled edges. A good copy, spotting throughout. Belli was professor of physics at the University Pavia. Offprint from: Giornale dell’I. 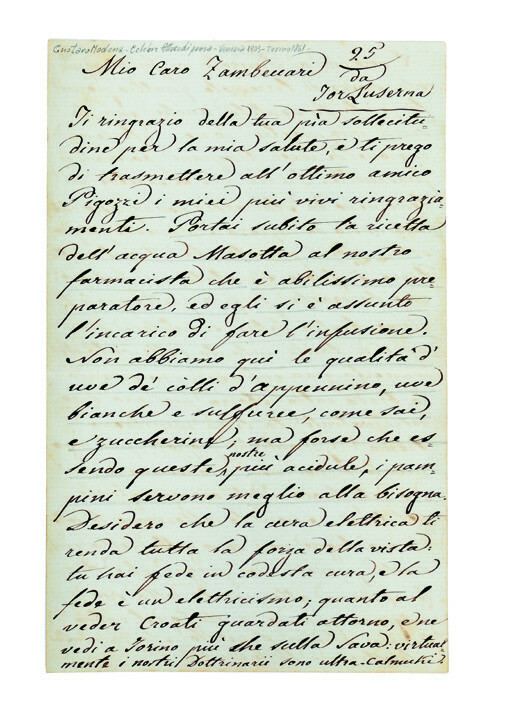 Reale Istituto Lombardo di Scienze, Lettere ed Arti, ii (1851). 1851 212x137 mm. 20 pp. (including half title). Remains of spine, both cover of the original wrappers lacking. A very good copy. Unsignificant, and marginal spotting; sligtly finger-soiling to p. 9. Offprint from: Bulletin de l’Académie Royale de Belgique, xviii (1851). Siracusa Antonio Puleio 1852 193x116 mm. 59,  pp. Contemporary wrappers, a bit soiled the front cover. An excellent copy, slightly finger-soiling to title, otherwise internally very clean. 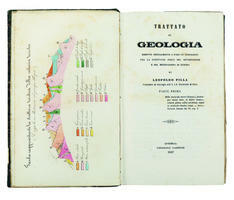 A very rare account on the Sicilian earthquake of 1848, by a member of the Accademia Gioenia, at Catania. Milan Tip. Bernardoni 1858 323x237 mm. 11,  pp. One plate showing Cavalleri’s seismograph (outer and lower margins light frayed). Contemporary blue wrappers, sides slightly torn. A very good copy, light spotting. On the upper cover, author’s name pencilled. Cavalleri was professor of physics at the Barnabite College, Monza. Offprint from: Atti dell’I. Regio Istituto di Scienze, Lettere ed Arti, i (1858). Il Terremoto alla città di Norcia il di 22. Agosto 1859. Preghiera all’Onnipotente Iddio, alla Vergine Santissima, ed a S. Emidio che fa la su detta città per essere liberati da tal Flagello. Rome Baldassarri 1859 Broadsheet (228x175ca mm),  l. A very good copy, somewhat browned along fold, a few slightly spotting. On the upper right corner the letter ‘P’, in red crayon. Very rare broadsheet, containing a prayer for God, Virgin Mary and St. Emidius’protection against earthquakes. Sui Terremoti. Lettura pubblica tenuta nella grande Sala del Liceo musicale Rossini, in Bologna il dì 11 Dicembre 1870. A beneficio dei danneggiati dal tremuoto in Romagna. Bologna Nicola Zanichelli 1870 225x144 mm. 42 pp. 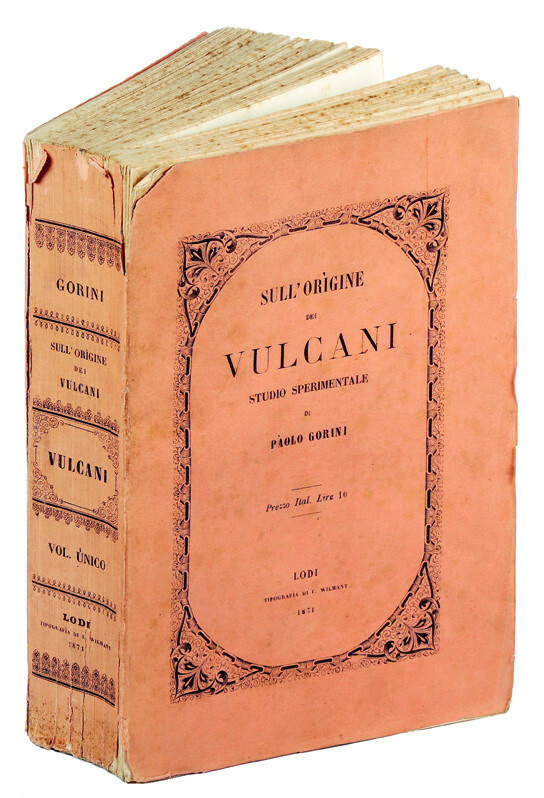 Original printed wrappers, on the rear cover the advertisement of another work printed for charity by Bombicci, La storia di un sasso (1860). Somewhat scratched the front cover. A very good copy, a few staining to scattered leaves. Bombicci was member of the Governative Commission appointed to survey the Romagna territory affected by the earthquake. Printed for charity. Ancona Succ. della Tip. Baluffi 1873 170x115 mm. 24 pp. Original printed wrappers. A very good copy, a few, marginal spotting. Offprint from: Il Corriere delle Marche, nos. 90-91 (1873). Milan Tip. Bernardoni 1873 234x158 mm. 8 pp. Contemporary blue wrappers. An excellent copy, title slightly soiled. 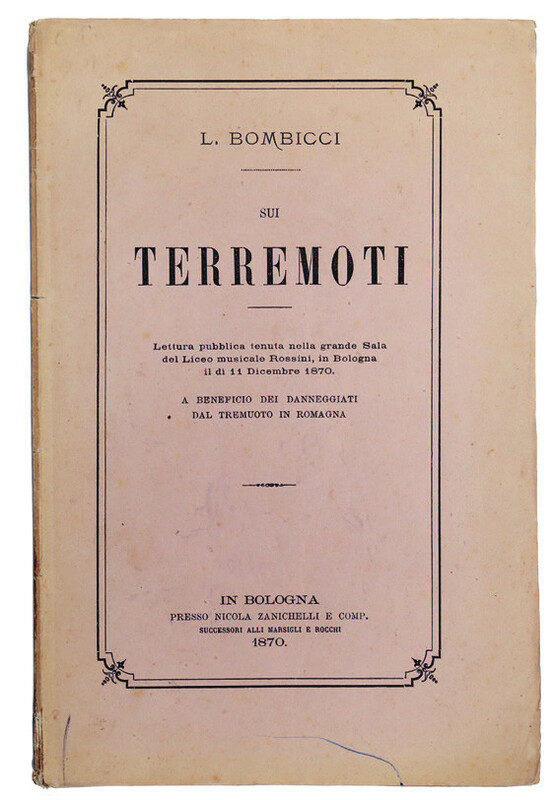 Memoir, dated 19 June 1873, by the Scolopian Serpieri on the earthquake occurred on 12 March in Urbino and other towns of Central Italy. Offprint from: Rendiconti del Regio Istituto Lombardo di Scienze e Lettere, vi (1873). Sul terremoto avvenuto in Italia il 12 marzo 1873. Nota… presentata nell’adunanza del 15 maggio 1873…. Milan Tip. Bernardoni 1873 234x162 mm. 14 pp. Contemporary blue wrappers. An excellent copy, a few small and light stains on title. On the rear cover the inked note ’Omaggio dell’autore’; on the first page ’Esemplare corretto dall’A.’, in blue crayon. Offprint from: Rendiconti del Regio Istituto Lombardo di Scienze e Lettere, vi (1873). Intorno ai mezzi usati dagli antichi per attenuare le disastrose conseguenze dei Terremoti. 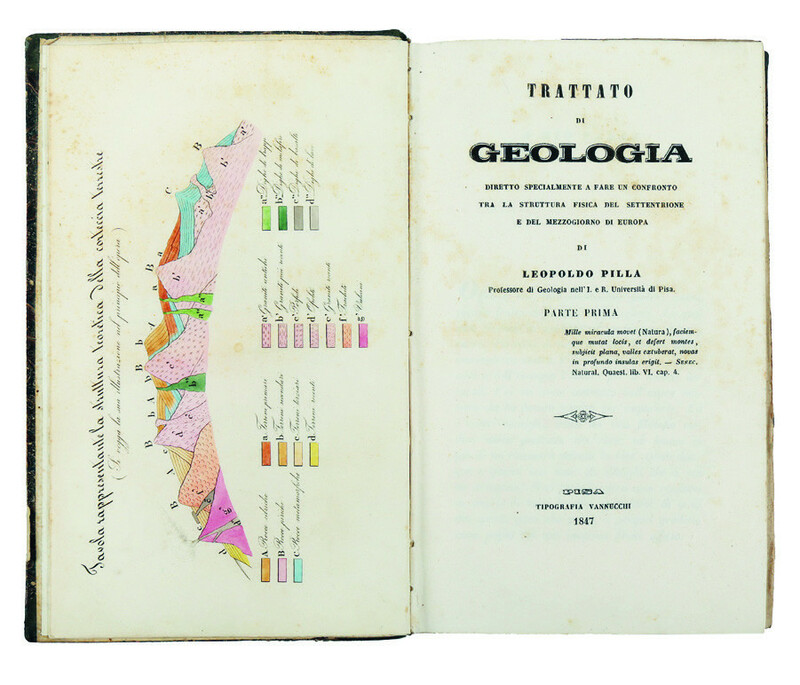 Rome Tipografia delle Scienze Matematiche e Fisiche 1875 300x227 mm. 76 pp. Diagrams in text. Original printed wrappers. Light browning, lower and outer sides frayed. A very good copy, largely unopened. Title slightly spotting, a few stains. Offprint from: Atti della Accademia Pontificia dei Nuovi Lincei, xxviii (1874). Rome Tipografia delle Scienze Matematiche e Fisiche 1875 300x220 mm. See the previous item. Original printed wrappers, small holes to the outer sides, extremities slightly damaged. A good, unopened copy. A minor loss to title, not affecting text. Rome Tipografia delle Scienze Matematiche e Fisiche 1875 304x230 mm. 39 pp. Numerous diagrams in text. Original printed wrappers. An excellent, unopened copy; occasional spotting. Paper on the nature of the pendular movements; offprint from: Atti dell’Accademia Pontificia dei Nuovi Lincei, xxviii (1875).